The Fellowship was fortunate enough to obtain a copy of FRANKENSTEIN UNDERGROUND #1 from Dark Horse Comics. Mike Mignola writes, Ben Stenbeck draws and Dave Stewart colors. It’s 1956, and the Frankenstein creature is still feared and hated wherever he goes. He’s been attacked in Mexico and found himself at a ruined temple, where an old woman heals his wounds. But the hunt hasn’t ended yet; a wizard has his sights on the creature and sends one of his pet demons to capture him. The creature is angered, and his shouts to the gods of the temple appear to have been heard. Many have speculated on the fate of the creature after Shelley’s novel ended, but they didn’t have the dark fantasy style of the Mignola-verse on their side. The creature’s story is one of loneliness, fear and sadness, and this is set in a world where “tortured soul” takes on a whole new meaning. I can’t wait to see where this story goes, and the art is, as always with this crew, darkly brilliant. Will the temple prove to be a prison or an escape for the creature? We’ll just have to read on to find out. Get on board now. 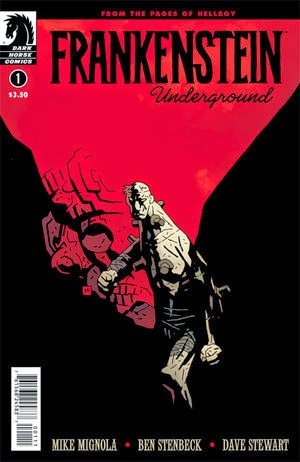 FRANKENSTEIN UNDERGROUND #1 is available now at your FLCS or at darkhorse.com.